I’m typing this with paint-stained hands with 30 Rock on in the background. We are taking a break. I think that somehow unintentionally we are going to finish most of the nursery this weekend. Granted, we are missing a few important pieces of furniture, namely the crib. But I am not worried in the least. I have three months to go. And even if she comes a little early, I feel okay. I hate to admit this, but I love nesting. In fact if I could stay in my second trimester forever and truck through a bunch of attics, I would seriously consider it. Maybe that is why I watch Clean House over and over again. I have a purging/reorganizing/decorating disease. Seriously. I came very close to knocking on Rocky’s door tonight to see if he wanted me to touch up the paint on his trim. But I decided that I could save that as a surprise if we watch the Duke game in his apartment while he reunites with his friends in Vegas this weekend. Rocky, I hope you’re not reading this! Granted it might just be a fleeting idea. I think that we were prompted to start painting because of IKEA’s tax free weekend sale. I took all of my fabric samples and old paint cans over to the Benjamin Moore Street at 5th and K. A gentleman came up to help me. I was a little swayed by the paint color in Little P’s room on ohdeedoh. When I pulled out the swatch for Benjamin Moore’s Robin’s Nest (#618), the guy immediately created a color spectrum from my fabric. He gently steered me towards Forget Me Not (#2049-60) instead. As he looked at the colors, he said “I sure hope this is a boy.” I told him it was a girl and I have some pink and orange items for the room. Then I said that I originally intended to get a green paint. But I considered that the blue could be like a sky and walked to counter to place my order. Then I decided maybe I should email a picture to Henry. Good thing I did. Henry, on the other hand, was not so keen with an idea of a blue closet. It took me a couple of calls to get it out of him, but he finally said that he wants a green. Plus he didn’t want the baby to be all Tar Heeled out. I can accept that. So I went in and picked out a green one. I tried to confirm that the Wales Green (#2028-50) didn’t look too bad with my fabrics. I finally admitted that my blue chair was fabric that I bought for a bargain and you wouldn’t really even see the two together in the same view. The green certainly makes the pale blue look more gray. (But I have always liked the color gray, because it is in fact my middle name.) 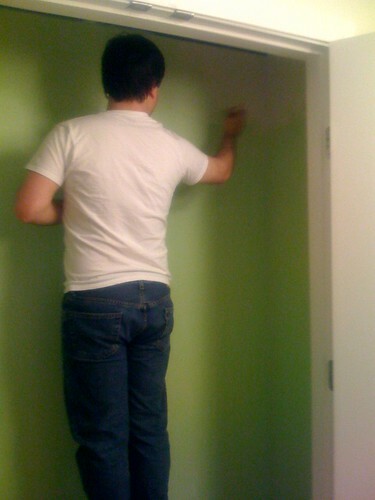 I can’t decide if he just sold me this green paint because that was what he thought I wanted or if it really works. But let’s get real. It is just a closet – a closet with the changing table inside. But none the less, a closet. Do I love this color? Not yet. But we will see. I guess I should at least wait until it is all pulled together. So I taped the trim and patched the holes. Henry said that he was so proud of my momentum that he thought we should go ahead and start painting. This apartment is a complete disaster zone with fifteen unfinished projects, including dirty dishes from dinner, unfolded laundry, papers from a frantic call to check on my dental insurance and just piles and piles of other things. But we dove right in. And I think that we may pull it off tonight. Well, that will be if Henry pulls it off tonight. I still have to make my invitation list for my shower, which will be here in three weeks! Yikes. Now that is where I have been seriously procrastinating. I have to say . . . I love the green! The finished room is NOT my room. Alex thought it was, too. But we did buy the same shelf from Ikea. They are great. I already have the same shelf at the studio.